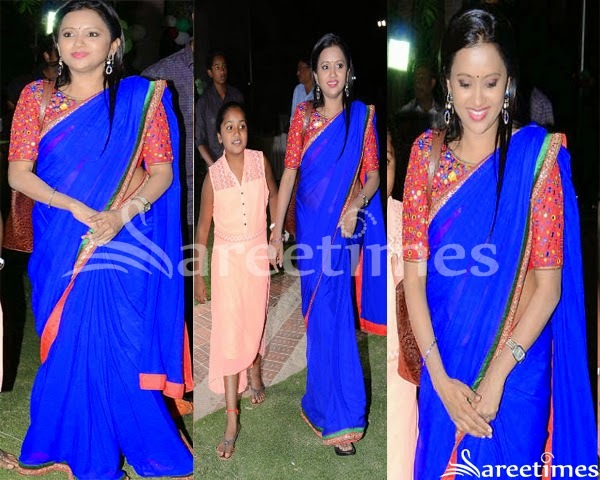 Actress Suma Kanakala wearing a blue plain saree with mirror work patch border. Heavy embroidery work and mirror work paired with 3/4 th sleeves blouse. Anchor Suma looking beautiful in black and multicolor designs half and half saree at Manam 100 days function. Black embellished patch work designs all over black saree and glittering border,followed by pink simple line. Paired with designer cap sleeves saree blouse with round neck pattern. Embellished flowers through out neckline. South Indian anchor Suma in beautiful green and cream designer half and half saree at actor Shivaji Raja Daughter Wedding. Gold embellished leafs across it pink border,applique patch work around it border. Gold embroidered work all over cream saree. Paired with pink embroidered quarter sleeves saree blouse with tricolor border. Embroidered buttes highlighted on it. Anchor Suma in beautiful green designer plain silk saree with gold silk plain border, Paired with contrast gold color zari weave rich crystal work bridal blouse. sequins and mirrors adorned throughout the blouse with square neck patterned. Anchor Suma in beautiful pink designer plain georgette saree with double borders. Crystalized glittering work around the black, Paired with black and gold designer short sleeves saree blouse with round neck pattern. Simple pink line around the neck line. Crystalized glittering work all over gold. South Indian actress Suma in beautiful red and yellow designer georgette benaras lehenga style saree.The saree comes with yellow benaras pleats with beautiful red and gold heavy zari antique double border. Brocade gold zari work bhoota throughout the pleats. Red Georgette pallu comes with sequins gold shimmer border and gold rich work attracting decorated flowers. Paired with green designer short sleeves saree blouse. South Indian actress and popular TV anchor Suma in beautiful yellow and red designer printed half saree with yellow crushed silk festive lehenga with delicate bandhini printed border and followed by gold fancy lines. Zigazag printed work throughout in orange color and red chiffon dupatta with gold temple border.Paired with designer quarter sleeves saree blouse at Sitamma Vakitlo Sirimalle chettu movie audio release. Tollywood anchor Suma in beautiful pink designer embroidery saree, embellished with patch,embroidered sequins buttes and lace border paired with designer short sleeves saree blouse. South Indian actress and anchor Suma in beautiful green and red designer gorgeous saree with patch border work paired with designer saree blouse at Cinemaa Awards 2012. South Indian actress Suma in red designer hot plain saree paired with designer short sleeves saree blouse. South Indian actress and anchor Suma in beautiful red designer georgette saree with border work paired with designer embroidered cap sleeves saree blouse with mirror and wide neck pattern at cine Maa Tea Awards 2012. South Indian actress Suma in black designer cotton saree with gold zari border work paired with designer short sleeves saree blouse. Souht Indian TV anchor Suma in beautiful cream designer off white saree with embellished with zari work pattern and and border work paired with designer short sleeves saree blouse at Jr.NTR Marrige.